BWR Full Coilover - SS Series - Dezod Motorsports Inc - Home of the automotive performance enthusiast since 2002. The New BWR SS Coilover feature’s a wide range of height adjustments without changing the spring compression and sacrificing the shock stroke. 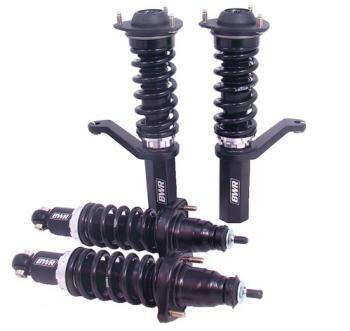 Traditional Coilovers requires the movement of the spring perch to determine the ride height, causing a reduction in suspension travel and induce coil spring binding. The bottom shock fork / connector is threaded to allow height adjustments to each drivers need without having to shorten the suspension travel by maintaining the original spring perch location. With this function, each driver can lower the center of gravity to achieve better handling, without sacrificing ride quality. BWR offers a limited 3yr. warranty on all of our coilovers.